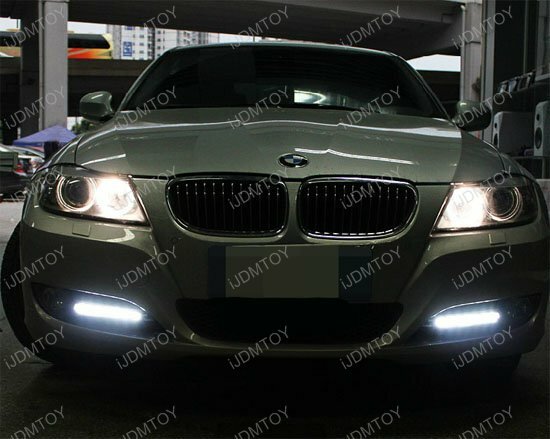 Q: How do I install this BMW LED daytime running lights? A: Below are a few pictures to guide you through the installation. Step 1: Most mesh inserts are held on by plastic clips, making it fairly simple for you to pop off the insert. Stick your finger into the mesh insert and pull down and out. You can choose to use pliers if you wish. Step 2: You should hear a light pop as you remove the mesh insert. 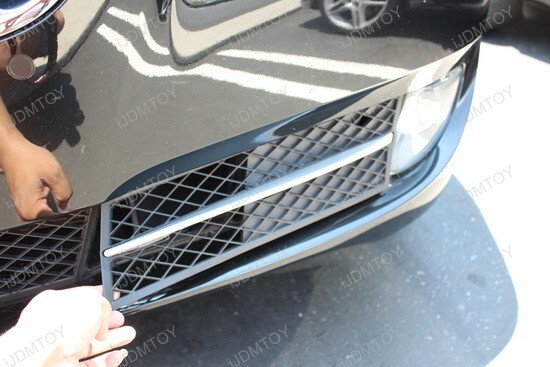 Please be advised that certain vehicles may have screws or bolts holding the mesh grill insert in place. For those vehicles, the bumper must be removed to gain access . Step 3: Once you have removed the insert, set it aside and install the LED daytime running light replacement. Tap the wires and test to make sure everything works. 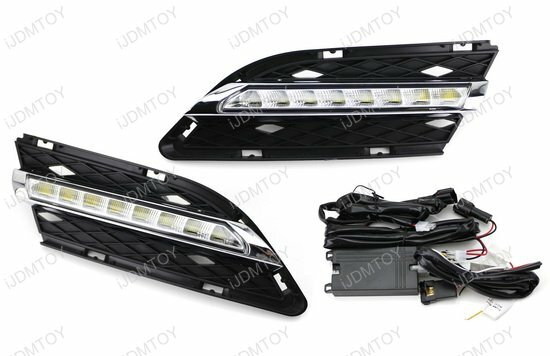 We also have this general direct fit LED daytime running light installation , please take a look. 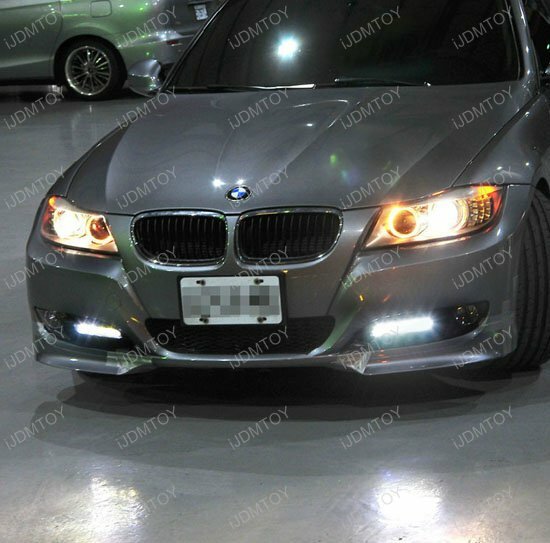 The concept is exactly the same, simply remove the stock fog lamp bezel cover, replace back with the LED DRL lamp and connect the wires. 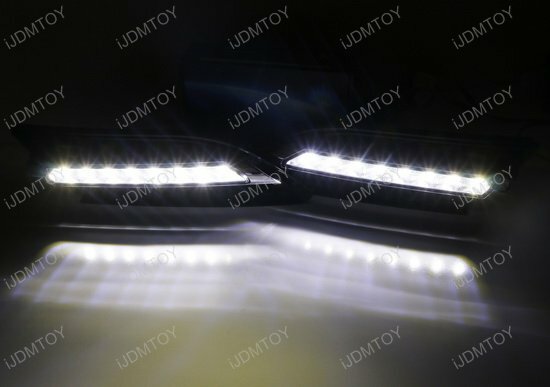 Q: How come when I test this LED daytime running lights on a 12V battery, the LED turns on and turns off immediately? 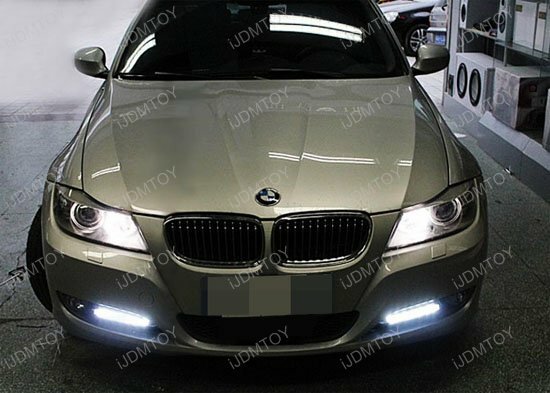 A: For this particular BMW LED daytime running lamp, you can not test it with a 12V battery because the DRL module box triggers the on/off using the current fluctuation. 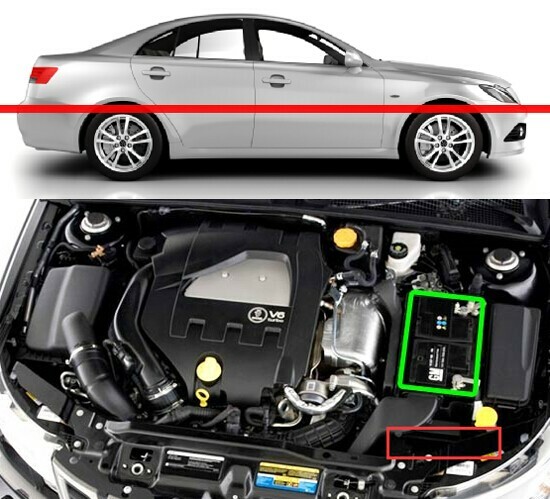 The red wires must be connected to the battery positive terminal and black wire connected to the ground and start the engine in order to test this product. 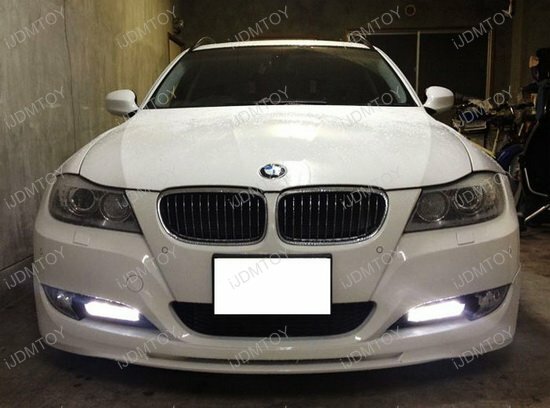 This page features one set of xenon white LED high power LED daytime running light lamps direct OEM fitment for 2009-2012 BMW E90 LCI 328 335 Sedan. 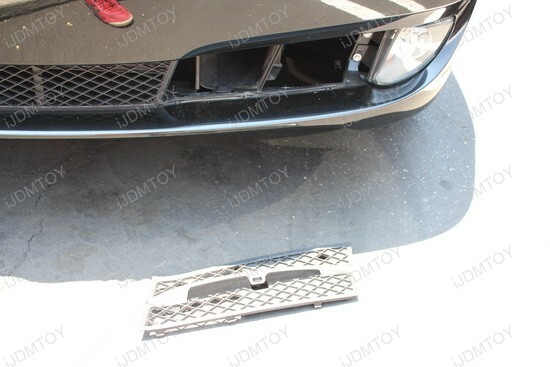 Other aftermarket universal fit LED daytime running light bars, you have to drill, cut and modify to get it fit. 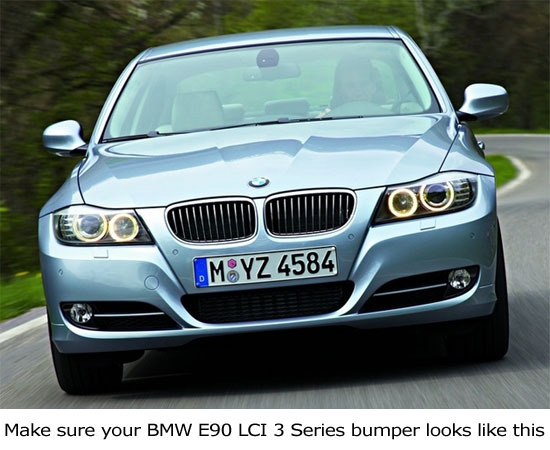 Our direct fit LED daytime running lamps are a replacement with perfect integration to your BMW LCI 3 Series Sedan with an updated OEM style and look. 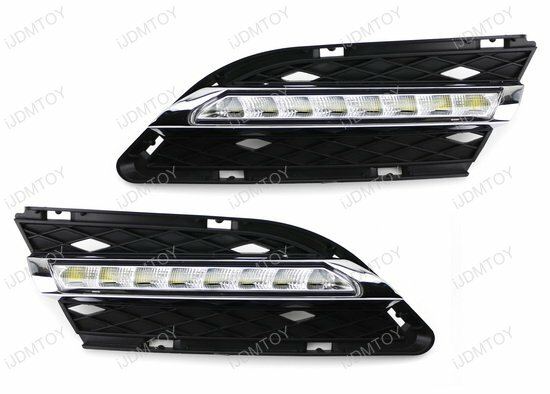 The direct bolt-on for the stock bumper grille insert and 15W total output gives you a super bright look. Product is very nice and super bright like stated. 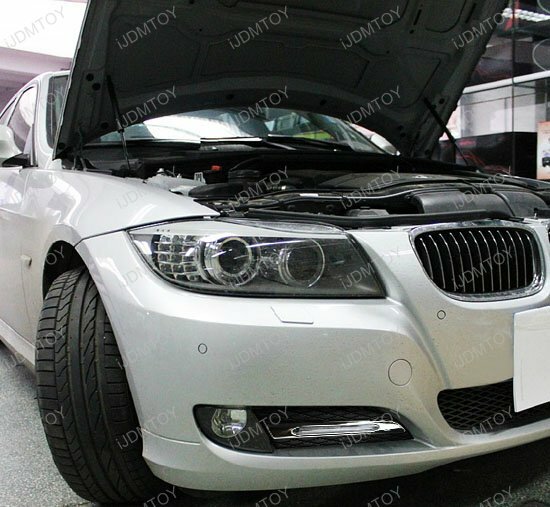 Installation is not that hard, just pull and remove the stock bezel and put back the LED DRL. 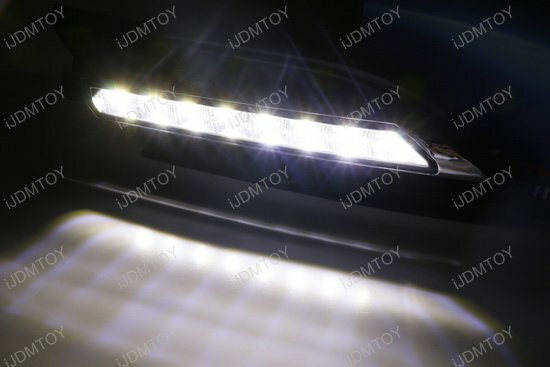 Looks very OEM, not like some random add-on LED bars bought on ebay.